FlossieBlossoms: Happy New Year! Presents, kittens and quilts, oh my! Happy New Year! 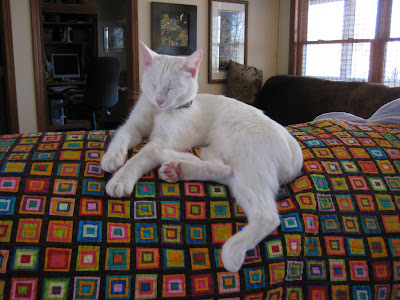 Presents, kittens and quilts, oh my! New Year's Day- it was a tough night! Nosey Parker needs a little icebag for on top of her noggin. Poor thing partied just a little too hard! And would you look at those MANKY paws? :) They aren't the sweet little pink things that they used to be, not even close. Giveaway photos! Woo hoo, LOOT! 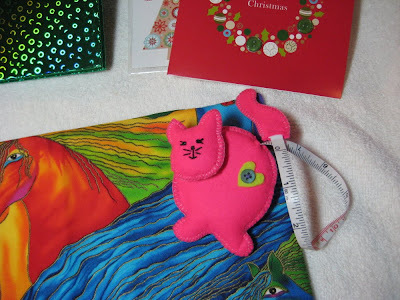 Recently, I won another giveaway from my quilting friend, Marguerite, at Adventures in Quilting and Sailing. She had a very generous giveaway with lots of prizes and winners and I was lucky enough to be one of them! The package arrived in perfect condition from the UK and just chock full of great loot! 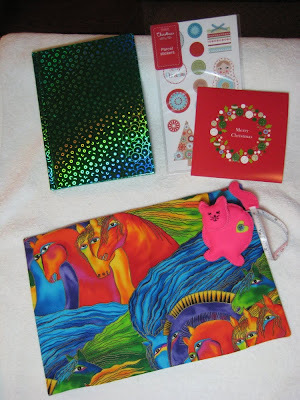 The big prize is a notebook with a cover on it made from the most gorgeous Laurel Burch fabric, Dancing Horses. I just love this, Marg! It's so ME, bright colored fabric, wild with lots of action, thank you so much. And the cool green notebook with the holographic green cover- it's almost a shame to hide that inside this cool cover. Also included was the CUTEST little felt kitty! At first I thought- "oh, she made something for Nosey Parker, isn't it adorable?" and then I felt it, it was heavy and kind of hard. *lightbulb moment* I tugged on it's little tail and voila! It's a tape measure! How cute is that????? I just love this and it's going to come in so handy, I'll be putting this in my purse when I go shopping, but the rest of the time it'll be in my sewing room, someplace safe but where I can see it all the time! (I may have to attach it to the ceiling to keep it away from marauders!) It is beautifully made, just perfect and quite inspirational, if you know what I mean! Also, a lovely Christmas card with very kind sentiments inside and some cool labels, too! Loot, I'm tellin' ya! What a fun package to get! Here are some of the pieces, this was taken in progress- I used 70 charms and an equal amount of the solid aqua blue. I had to steal a piece from a layer cake to make up the last pair of charms. I cannot for the life of me remember the name of the solid color, I'm thinking it's Kona Aqua but I could be wrong. I bought it months and months ago before I realized that I should write this important stuff down. And Hobby Lobby has stopped carrying this color, I made a special trip there to find it Thursday and they don't have any and won't be getting any and they didn't know the name of it, either. Grrr. Here's the top, nearly finished. I just have to sew my rows together. I had to square up each block as they were quite wonky, so I squared them to 8" and that made a wonderful difference and made the rows go together like a dream. Finished it will be about 37" x 53". Not too big, just right for a snuggly quilt. 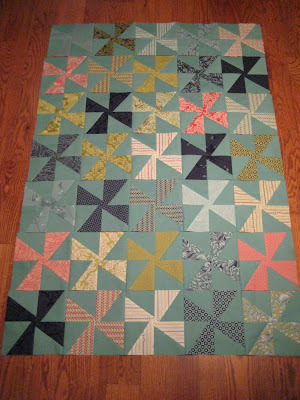 I'll get this finished up today and set it aside to finish when I get something for the backing. I love this fabric, though, it's so fun! I hope you all have a great 2010 and get lots of fun things made and enjoy being creative. Susan!! That quilt is awesome. I love that fabric and the solid...whatever color it is...is just right!! I used some of the Neptune (and I didn't even know that's what it was called because I bought remnants!) in my Sissy's quilt...the two prints at the bottom of the right hand row and the top one in the second from the left row. Those fabrics feel sooo good!! Happy New Year to you...enjoy your fun stuff from Marg! Hopefully my package will come today! What a cute tape measure! And I love the quilt! That is going to be lovely! I love that quilt!! The colors are fabulous; it's a one of a kind creation!! What a darling picture of NP. It looks like we both felt the same way on New Years day. I actually went to a party and the hosts cooked all French food to honor Julia Child and the movie "Julia & Julie". Well, the food was great, and of course I couldn't turn down a couple of glasses of bubbly could I? Anyway it doesn't take much for me to feel "happy" (my nickname used to be "Two Sip Sue"). The next day I took several "cat naps" to make up for being out past 9:00...er...I mean midnight. So glad you liked your parcel Susan. You HAVE discovered that to get the measuringtape back in to press his tummy? (feel for the button...). Love your Neptune quilt! It looks fab! LOVE that tape measure! Mine in my handbag is a panda - though not nearly as cute as yours (or handmade, either!) Poor Parker looks like she's got a sore head. Youngsters, eh? *tsk* She'll learn! this quilt top is so pretty! 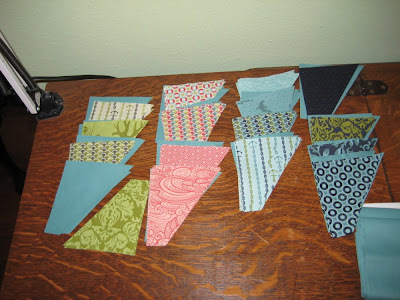 i love the neptune fabrics and the pinwheels...it is amazing.